Halloween is a great holiday for children to enjoy. Before the actual day kids can choose their costume and carve a pumpkin. It is a great time for children to be creative and enjoy activities with their friends. 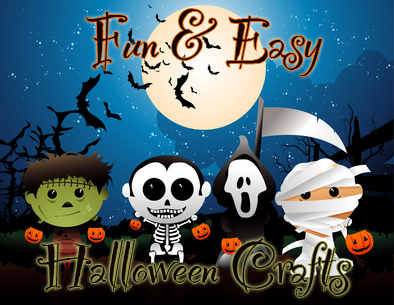 Here are a few festivities and activities that are great Halloween activities in addition to costumes and pumpkins. You can either create this at home and use it as decoration for a party, or you can have a group of children each create their own Jack-O'-Lantern and add it to a string of unique Jack-O'-Lanterns. If you want to be really creative each child can create their own Halloween character to add to the string. Give each child a selection of construction paper and a pair of scissors. Each child can cut out their own Jack-O'-Lantern shape and draw on a unique face. Or the children can each come up with their own unique Halloween character to add to the string. Be sure that each child creates a stem or top loop on their character, that can be used to fold over and glue to the string. Another fun Halloween activity for children is to create their own Halloween masks. You can even hold a scariest mask contest if you want during your Halloween festivities. Give each child a pair of scissors and a selection of construction paper and craft items. Ask the children to create their own scary mask using the items present. When each child has finished their mask you can punch holes on either side and tie a piece of string at each end which can be used to tie the masks on to their faces. When all the children have finished their masks you can hold a Scariest Mask contest and award the winners with special Halloween treats.